Stuffed Cabbage Rolls - just like Mom used to make, well just like my Mom used to make. 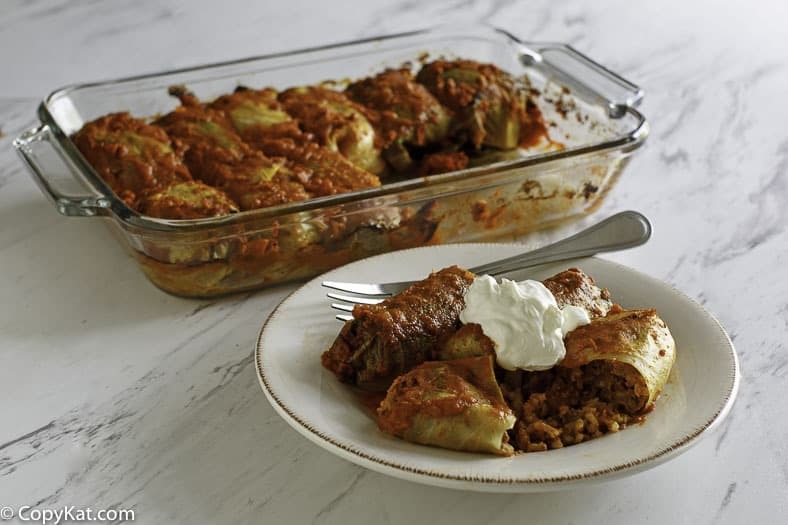 There are two kinds of people in this world, those who know and love Stuffed Cabbage Rolls, and those who haven’t tried stuffed cabbage rolls. Either you’ve grown up with your family’s coveted recipe, or you haven’t. If you are among the latter, then you are truly missing out on a nutrient-packed comfort food. Although their specific origin is lost to the ages, Stuffed Cabbage Rolls are most definitely European, probably from the East and certainly from the underprivileged. But don’t let their humble beginnings deter you from their wholesome taste. Recipes for Stuffed Cabbage Rolls are as diverse as the peoples who carried them through generations. When the meat was scarce during the war, or too expensive after the war, people used grain, usually rice, to stretch the portions. Cabbage has always been inexpensive despite its nutrient punch. The cabbage roll filling is almost always a grain, a meat, some spices and egg to bind it all together. Some recipes call for cooking the ingredients on the stovetop before stuffing the cabbage leaves, others are stuffed raw. Some are then baked in a sauce, still, others are fried. They can be savory or sweet, meaty or vegetarian, hot and spicy, and don’t even get me started on the folding techniques! Although one can create a lot of variety by changing up the meat and the grain, it is the combination of spices that make each region’s and each family’s recipe unique. Well, that and the folding…and the sauce. The region one’s grandmother came from often determines the choice of sauce. Hungarians and Romanians are partial to gravy made from flour and broth. Every second year, together they hold a Stuffed Cabbage Roll festival, called the Töltött Káposzta Fesztivál, featuring cooking competitions and cabbage roll tasting among regional, folk entertainment. Ukrainians prefer a sweet sauce made with brown sugar and raisins, while Western Europeans bake their Stuffed Cabbage Rolls in tomato sauce. 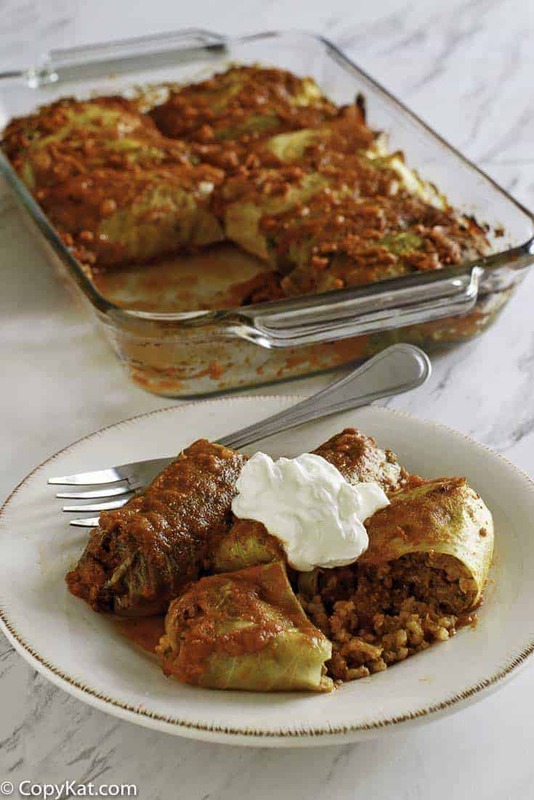 But for all the variety, one thing is always agreed upon: stuffed cabbage rolls always taste better the next day! Stuffed Cabbage rolls have an unpretentious appeal. They are a simple food, with basic ingredients but the end result is something special. Stuffed Cabbage Rolls were a favorite around my childhood house. Growing up, my Mother often made them, as so many women did, trying to stretch the family budget. The family recipe I’m sharing with you is one of my Mother’s specialties. Try your hand at Homemade Stuffed Cabbage Rolls. Clean, core, and boil cabbage until tender but not done. Mix together the water and the tomato sauce. Combine meat, onion, green pepper, rice, crackers, salt, pepper, and egg and 1/4 of the tomato sauce. Spoon mixture into leaves, roll and place in deep baking pan. Pour remaining juice over roils sprinkle with sugar and bake for 1 hour at 350 degrees. You could use 3 tablespoons of flax seed combined with 1 tablespoon of water. You should use something to bind everything together. I used to buy a frozen version of these when I was in college. Happy to make them at home now! Wonderful, classic flavor with these! These look amazing! I haven’t made these before and now I need to! Oh man do these look good! Perfect fall comfort food! We LOVED these cabbage rolls, thanks! These are just like my mom’s! Magnificent! Oh what a stunning dinner recipe. I have always seen others do it but never knew that it was this easy to make. Thanks for sharing the recipe. I have eaten cabbage rolls based on a recipe (or speaking directions) passed down in my family and extended family all my life.. I NEVER had cabbage rolls with ANY tomato anything on them until I was at least 30 years old—and that was a frozen Stouffer’s roll. My heritage is Polish and we always referred to the cabbage rolls as Holubschzkee (sp?). The ingredients are: As large a head of cabbage as you can get, rice, breakfast sausage or ground pork, salt, pepper, and bacon. We cook the rice, we brown the sausage and par cook the bacon separately. Mix the rice and sausage and seasonings together, and roll heaping spoonful(s) in steamed and de-ribbed cabbage leaves into tidy little bundles. With a piece of the bacon, rub the bottom and sides of a roaster or deep casserole dish. Then we load the bundles into the roaster and put a couple of slices of the bacon on top of each layer and on the top layer, and add a few more pieces of bacon. We cover it and put it in the oven at about 300 degrees for 2-3 hours. These are a completely different and wonderfully cabbage-ey roll.They are pretty stinky while cooking–most people think–not me, though–I love that aroma. We usually make and eat these when Dad’s 15 to 20 pound cabbage heads are ready from his garden—it takes a BIG canning kettle to steam the cabbage, Several of us do the cooking, steaming rolling, baking the cabbage rolls and then more members of the family come over and feast on them-sometimes as many as 35 or so of us! We love these flavors together so much,and no tomato sauce to kill the cabbage flavor. I have devised a way to get by the rolling bundle part, and make a sort of casserole with the ingredients—-I’m still developing that, but I have learned that the cabbage still needs to be steamed, and layering them in in a casserole with the sausage/rice mixture seams easy enough, but don’t skimp on the cabbage!..and of course, remember to place the par cooked bacon on the layers as well—I don’t use as much bacon on each layer because the layers are thinner than the rolls. Still very good, but when we have the gathering we stick to the real thing!! Yum, de yum, yum, yum !!!! I can’t believe that I have waited until now after over 60 years to put this ‘recipe’ in writing. I have searched high and low for a similar recipe, but outside of my extended/married family, I have never found it—also never even in a Polish restaurant here in Minnesota….there may be some Eastern European heritage folks up in NE Minneapolis that still cook these, but I just haven’t met them yet!!! My wife and my mother both have made cabbage rolls and they too used all the ingredients that you have shown….with one exception. They always precooked the ingredients in a skillet on the top of the stove before spooning them into the cabbage leaves. We use a rice steamer to prepare the cabbage. Placing the whole cabbage in the rice steamer it separates the leaves without any problem. I pre-cut the leaves away from the core or the stem as it might be called. Place the cabbage directly under the water facet in the kitchen sink and allow flowing water to remove the leaves and this eliminates splitting or breaking the leaves. By placing the cabbage head with the stem facing the bottom of the sink and allowing the water pressure from the facet to force itself under the leaves they will lift over almost by themselves very gently and whole.